been a while since i've posted anything or really been involved around here. i can say my violin practicing has kinda slipped a bit lately and for some reason while tapeing this i got nervous. lol. I have found when i'm recording something of myself i tend to try too hard and end up messing up my innotation and get lost on the sheet music, but i tried to keep that to a minimum today and stay as relaxed as possible oh and sorry for the weird angle. my previous posts have all been played sitting down and i've been playing a lot standing lately and i have nothing that really sits the right height so its at a kinda weird angle and the fact that my comp mirrors the images doesn't help. lol. anywhoo any and all comments/critiques, especially critiques are welcome. Upon watching the video myself i really really need to work on my bowing. What else ya got to throw at me? Encouragement all the way from here @RockingLR33 - Way to go !!!! (1) intonation - WAY better than mine ! Anyway - that was just a comment / observations from someone who doesn't know a lot yet - and well done ! As Bill said, you are using too much shoulder movement and not enough elbow. You're bowing will be much better if you get used to using more elbow and that in turn will improve your tone as well. Great job. Glad that you are posting again. I assume the video is a mirror image. Your left-hand form is very nice: first finger pulled back low and square, fingers kept close to the strings. Your intonation is very nice. Yes, you need to be using your elbow. But I don't know why people don't mention the wrist in the same context. As I see it, straight bowing requires both wrist and elbow involvement. There is a learning aid called Bow Right that I think might be a big help in straightening your bowing. I've never used it or seen it used, but it looks like it would be good for bow-stroke training. I posted a link to the, "Bow Right" assist gizmo last week. I think it was for "StoneDog" who claims he has trouble keeping his bow from wandering. But, i'm sure you can get along without using this type of apparatus. Practice bending your wrist when your arm is fully extended on the downbow. As, FM and RU mentioned, there's no flex in your elbow, it's like having a plaster cast on your arm from your shoulder to your hand, including your hand. You need flex. 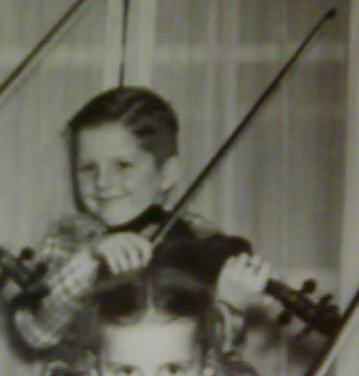 I believe that's the reason the good Lord gave us joints in the elbow and wrist was to be able to play violin. We have a similar product that super-sensitive sent us a while back. It's called the "Tone-Shaper Bow Guide" I'll test it soon. One thing about the bowing guide is that you don't know it's there unless you make a mistake, and then you feel a scrape. It took me a long time to straighten out my bowing and develop a smooth stroke. I think this could save someone a lot of time. It would force you into proper form right away, so that you would learn what proper form is. I wouldn't expect to use it for much more than say 30 hours of practice. I wouldn't expect this to cause dependence. But there are a lot of reviews at amazon by people with actual experience with it. I'm agreed with RosinedUp, but i kinda have a dual opinion about things like this (tapes, other guides, etc...). On one side i think that it could really save some time at the beginning. If i'm concentrated on the sound that i produce, and find a most nice and solid one (bowing open strings works well) - i find that in that moment my bow moves closer to the perpendiculair position to the strings - the same is considered as a straight bow. What is the benefit of that method - is that when one can come to a conclusion what is right consciously, then it stays longer and developes faster, in right direction. We all understand that playing violin is a lot about automatizing the skill, but there are (that's again my opinion that might be not right) 2 ways to approach this - mechanical (repeating the right thing to automatize) and conscious - understanding why things work better this way and not another, what the whole thing consists of. The last one can seem difficult and boring but, as for me, on practice it way more simple and fun if one pays attention. 2*3=2+2+2=4+2=3+3=etc... and now You can play with this as long as it needs to become a skill. So it depends of what particularly one wants, how it's easier, and personal preferance. If one doesn't know what to want or prefer - no problem, one can TRY and figure out. As my teacher says: "Imagine what it should sound like, and hands will do it by themselves". Well, that is quite a fairy expression, but in the whole it's true if one sets a goal and knows exactly what the small steps are. What is the benefit of that method - is that when one can come to a conclusion what is right consciously, then it stays longer and developes faster, in right direction. center on the development and improvement of this correlation. things that do not need any more practice, one is wasting time. then to proceed to the next one. very interesting ideas on the subject of using the "tools" such as the bow rights and such. I am more inclined to the "prepare the mind to aching the goal" kinda person and that ways seems to be the best for ME personally, but if i need to resort to a helping tool because i just can't get it, its definitely nice to know its there I think half the fun about being self taught is seeing how much we can get right the first time, and in fixing some mistakes as we progress (hopefully before they are to bad of habits to break). Thats why i love the critique videos where more experienced players can throw in comments and suggestions to help out the learning process.....all great ideas and the discussion is awesome guys!